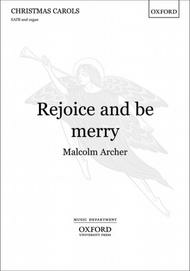 Rejoice and be merry composed by Malcolm Archer. For SATB choir & organ. Mixed Voices. Christmas, Choral Leaflet. Vocal score. 12 pages. Duration 2'. Published by Oxford University Press (OU.9780193368965).ISBN 9780193368965. Christmas, Choral Leaflet. 10 x 7 inches.For SATB and organ. This is an upbeat and joyful setting of the traditional hymn text. Combining a strong melody, some modal nuances, and a fanfare-like organ accompaniment, it's a rousing carol that would be the ideal choice for opening a Christmas concert.